Find the EQC too small? Mercedes is working on a solution. Mercedes-Benz calls its lighter, smaller van by many names, and offers it with an array of engines around the world. And now it's . 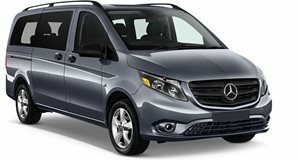 The Concept EQV is based on the commercial vehicle alternately known as the V-Class, Vito, Viano, Marco Polo, or (in America) as the . But instead of an engine combusting gasoline or diesel fuel internally, this version runs purely on electricity, and plenty of it. That – in name, style, and propulsion – aligns it closer with the than with Daimler's current commercial vehicles whose future this concept forecasts. The EQV packs an electric powertrain that goes far beyond what Mercedes currently offers in the full-size or the eVito with which this concept shares so much. Instead of the 41.4- or 55-kWh batteries offered (respectively) in those models, the EQV incorporates a 100-kWh's worth of lithium-ion. And instead of 85 kW (114 hp), this concept packs 150 kW (equivalent to 201 horsepower). That's enough to propel it along at up to 99 miles per hour (much higher than the 75-mph top speeds offered by the eVito and eSprinter) with a range of 249 miles. That's more than double the 93 miles that those existing models can travel. It'll even quick-charge for a short, 62-mile trip in just 15 minutes. And as you can see, the concept van has also been upgraded stylistically to match the EQ sub-brand's design aesthetic. The silver paint and chrome trim, with 19-inch alloys, LED headlamps, and cleaner-looking bumpers. 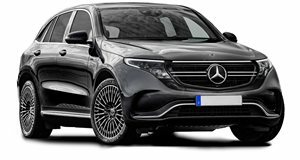 But the bigger upgrade is found inside, which (unlike the more cargo-oriented eVito and eSprinter) is geared towards transporting passengers in the lap of modern luxury in the style that the company's passenger-car customers have come to expect to find behind the Silver Star. The seven- or eight-passenger cabin (depending on configuration) features black and blue Nappa leather, rose-gold and dark-chrome trim, and the automaker's trick MBUX infotainment system – complete with self-learning voice control. Though it's been unveiled here in as a concept, Mercedes indicates it plans to put the EQV into production as a more commodious alternative to the EQC as it aims to offer electrified versions of every model in its lineup. "Mercedes-Benz Vans is consistently advancing the electrification of its product portfolio," said Daimler's Wilfried Porth. "With the Concept EQV, we are now taking the next step."